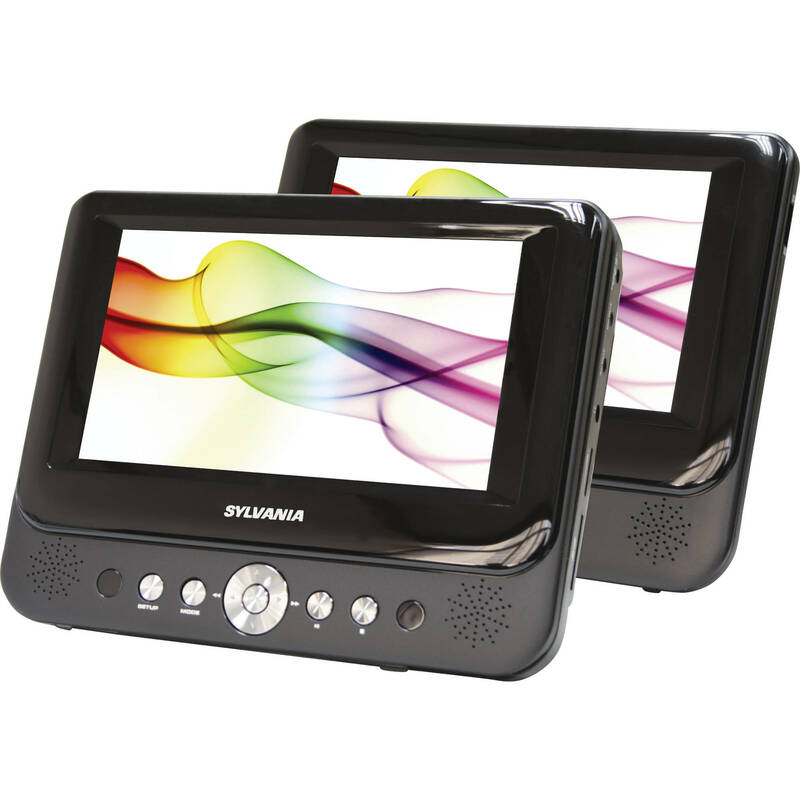 The Sylvania SDVD8737 7" Dual Screen Portable DVD Player features dual 7" widescreen TFT screens with a 16:9 aspect ratio. The DVD player can play DVDs, DVD±R/RW discs, CDs and MP3s. For added convenience, each screen features its own earphone jack and the DVD player includes an AC adapter, a car adapter, and headrest mounting straps. It's ideal for extended road trips, long flights, hotel stays, camping trips, home use and anywhere else you want to enjoy a good movie alone or with friends or family. Box Dimensions (LxWxH) 13.2 x 9.8 x 2.5"
SDVD8737 7" Dual Screen Portable DVD Player is rated 3.8 out of 5 by 5. Rated 4 out of 5 by Anonymous from Perfect! We needed this for our long trips to the kids' grandparents' house and we couldn't be happier! The sound on the units themselves aren't very powerful. They are OK as long as it's not raining hard your bumpy roads, other wise we just plug The audio into the AUX input of our van and the sound is perfect. In all, we can't complain. They fit perfectly and work exactly as designed. Compared to Amazon and other online stores, the price for this being brand new can't be beat. Rated 5 out of 5 by STEVEN V. from Easy Setup CAME JUST AS DESCRIBED. EASY SETUP AND GREAT PICTURE. Rated 4 out of 5 by Adam from Good Product Good Price The portable DVD player works well, just don't over tighten the straps or the disc will make a horrible noise. Also keep in mind the disc starts over every time it loses power. So we only use it for long trips. For the price it is a very good option. Rated 1 out of 5 by Vibes from I would not by again Extremely noisy and has low volume. You can hear the DVD motor running through the unit (speakers or head phones). This was disappointing! Can i hook up a third monitor? This is a closed system. Another monitor cannot be connected. does this item come with AC/Car Adaptor and head rest mounting straps?? How does the disc load? Do you have to open up the unit or does it inject load? You have to open the unit and put in the disc. It is not difficult my six year old daughter does very easily. do the screens operate independent of one another? For each screen has its own cable. Each screen can be run independently, on each screen there are buttons to adjust the sound and picture. I hope I answered the question.I take this opportunity also to ask a question about the camera I bought for you, Sony HX50V, is there a VF that fits this camera and its price is less then $200? Does it have to be plugged in to work? Meaning, can I use it on an airplane? how does the unit with the dvd player share the signal with the other screen? do they have to be wired together, or is there a wireless signal?